Well how fun is that! 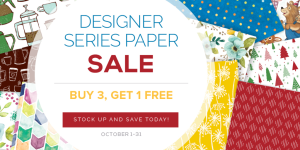 Several of my favorite Designer Series Papers are on sale thru Oct 31st. Stock up today! my favorite being the Petal Garden Designer Series Paper. 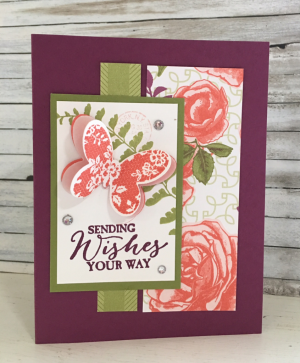 This was a very simple little lovely card that we stamped in class this past week. One of my dear friends and downline has a birthday tomorrow and I need to get this in the mail to her! Shes so special she's getting some of my favorite paper. Now who wouldn't love this paper…and when you buy three packs of DSP from this list, you can get 1 free. Now of course my other favorites…love love the Coffee Break and definitely, the Wood Textures… and the Whole Lot of Lovely is Nice too. See? There are 4 options for you and one of which can be free. Place your order today!